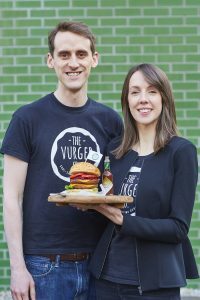 The Vurger Co. and Tabasco will be serving up a vegetarian friendly burger at a one day event to celebrate National Vegetarian Week. On Friday 19th May, Londoners can stop by Bishops Square, Spitalfields Market and sink their teeth into a new culinary creation with the debut of “The Auburger”. Aubergine sales soared by 18% in UK retailers last year alone. The versatile fruit appears in cuisines around the world; from aubergine parmigiana to babaganoush and from ratatouille to baingan ka bharta. Auburger seekers can expect smoky BBQ flavours and meaty textures from a not-so-top-secret-recipe of aubergine, onion and chickpea mixed with Tabasco Chipotle Sauce and topped with smoked cheese all served in a brioche bun. It’s #aubergenius. Masterminded by The Vurger Co. founders Rachel Hugh and Neil Potts, the duo will be on hand serving up single or double stacked Auburgers for £7 and £9 respectively and explaining how they’re taking the veggie burger out of the specialty aisle and into mainstream cooking. The Auburger will be on sale in Bishops Square, Spitalfields from 12-3pm on Friday 19th May while stocks last. For those unable to make it to the pop-up event and are keen to sample the Auburger, Tabasco has created a simple recipe that anyone can follow at home.